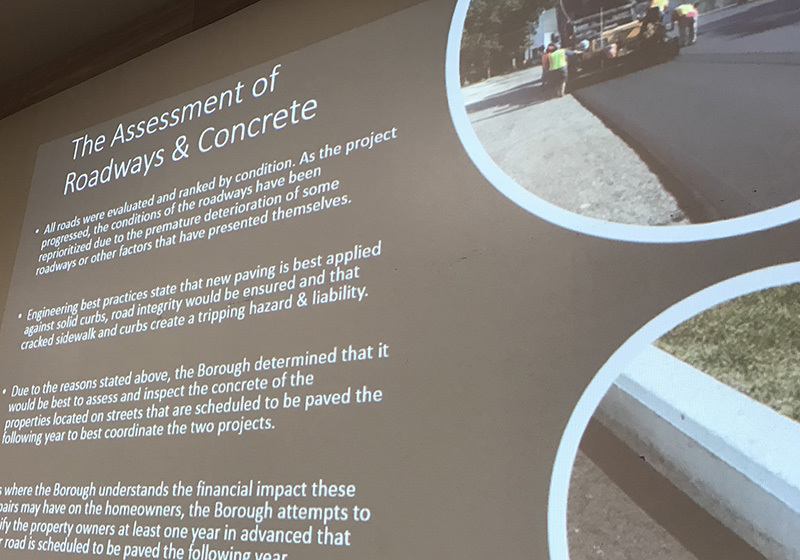 Jenkintown Borough Manager George Locke updated Council this week on the borough’s ongoing paving program and its accompanying sidewalk inspection and rehabilitation efforts. The eleven-page Powerpoint presentation gave council members a somewhat stilted view of what Mr. Locke has so far accomplished, perhaps hoping that council members don’t walk around town much. The presentation contradicted a few of our experiences and observations. Ownership: Mr. Locke correctly pointed to the state law that defines the duties of property owners to maintain their sidewalks and curbs, but responsibility does not equal ownership. We have previously shown that our sidewalk and curb are as much a part of the public domain as the roadway that abuts it. Lien Process: Once again, Mr. Locke outlined the borough policy of using the lien process to pay for sidewalk work should the owner fail to comply. At our hearing before Judge Elizabeth McHugh, he told her that council had decided not to do that. Which is it? In Mr. Locke’s presentation, he emphasized the word “may”, which makes this statement meaningless and arbitrary. Who gets the lien and who doesn’t? Where is the accounting for hardship? Penalties: Mr. Locke’s presentation stated that non-compliant owners could be fined $100 to $600. At our hearing, Judge McHugh, told us we could be fined $185 per day. Which is it? Walkability: We can’t say for sure what Mr. Locke’s definition of “walkability” is, and the word seemed to fumble off his lips when he said it, but to us it means a consistent, well-engineered, and unified pedestrian environment. We don’t have that. Safety: Mr. Locke pointed to the increased safety brought about by this program thus far. Does this look safe to you? Sidewalk and curb along Cedar Street. Curb reveal of exactly zero inches along Florence. This condition is also found on Runnymede at the bend. Here are just a few other examples where he failed on that account. This report came on the heels of a previous council discussion about establishing a program to loan money to property owners unable to pay for sidewalk repairs. While we laud any effort to make this onerous policy more affordable, bear in mind that not only will homeowners then pay double to triple what the borough would pay as part of a wholesale program, now they will pay interest on that exorbitant burden as well. When asked for an example of any community in Pennsylvania that currently offers such loans, I pointed to Lock Haven, but I also point to Ithaca, New York which instead applies an annual fee of $75 to all homeowners to pay for a more unified, wholesale approach. Once again, we have to ask: Is this policy fair? We already know that’s it’s needlessly expensive. We’re told that one resident with a corner lot just forked over $24,000 to fix their curbs and sidewalks that belong to the community. How does that make sense? Forcing homeowners to bear the full cost of a public resource is onerous, unnecessarily expensive, unfair, and produces poor outcomes. Why can’t we do better?